Thousands of people took to the streets in Egypt Saturday to celebrate the third anniversary of the 2011 revolution that ousted autocratic Hosni Mubarak, even as opposing forces rallied and clashes left at least fourteen protestors dead. The violence also comes a day after a series of bombs killed four people, fueling the government's anti-Brotherhood sentiment and all but dashing hopes for a peaceful and democratic future. 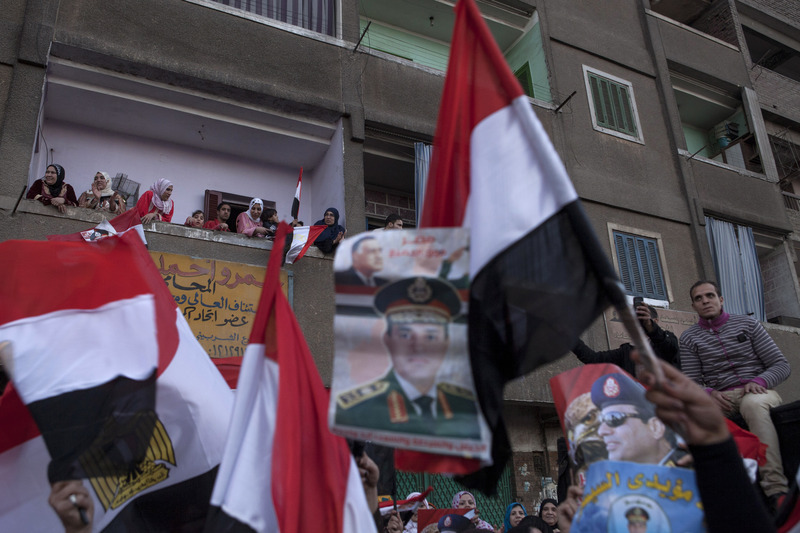 Even as tensions continued to rise after Friday's attacks, crowds of Egyptians poured into Egypt's capital Saturday to urge Gen. Abdul-Fattah el-Sisi, the military leader behind this summer's ouster that removed former president Mohammed Morsi, to run for president. At the same time, security forces fired live rounds and threw tear gas as anti-government protestors tried to push themselves into Tahrir Square, the epi-centre of the 2011 revolution. Four protesters died in Cairo, and another two were killed in the town of Minya, after clashes with police, while a woman was killed in Alexandria. Friday's wave of bomb attacks — which included a massive car explosion in central Cairo — left six people dead and the country braced for a new surge of violent struggle between the military-backed government and a growing Islamist insurgency. Though claimed by the extremist group Ansar Bayt al-Maqdis, state television immediately blamed the Muslim Brotherhood for the assaults. “We tell our dear nation that these attacks were only the first drops of rain, so wait for what is coming up,” Ansar Beit al-Maqdis said in a statement, according to a report by The Associated Press, warning Egyptians “to stay away from the police and security headquarters." Last week, over 20 million citizens voted in a landmark referendum on Egypt’s new constitution, with a whopping 98.1 percent of Egyptians voting “yes.” But though the country is poised and ready for its next step on its political road map, it is also sitting on the brink of turmoil, as security forces continue to crack down on the press while extremists get more violent. "State violence on an unprecedented scale over the last seven months," Amnesty International said in a recent statement. "Three years on, the demands of the '25 January Revolution' for dignity and human rights seem further away than ever".